6711061: 2006 Chevy Silverado 1500 / 2007 Chevy Silverado 1500 Classic. 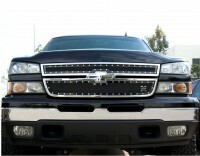 X METAL Custom Black Mesh Chrome Studded Grille (2pc). T-Rex Grilles is the leader in cutting edge custom grille designs and has done it again with the new X METAL Series Grilles. Starting with top quality stainless steel, T-Rex Grilles assembles a proprietary wire mesh into a precision laser cut frame surround. The entire section is then powder coated black. Attractive chrome studs are then added to give it that unique custom look that says: "there is no other truck like this in my neighborhood!" Set yourself apart with the latest in high quality custom grilles from T Rex Grilles. Comes complete with hardware and instructions. Two piece X Metal mesh grilles install directly into factory OE grille with modification required. Installation time is about 1/2hr. Backed by manufacturers limited lifetime warranty. Made in USA.